Anyone got a flywheel laying around for a points saw that'd fit the Frontier Mark I?I've looked all over my garage & can't find the flywheel that came with the saw.I've got two flywheels for a J'red 361,but with electronic ignition.I don't believe those will work on a points saw.Or,if I put the J'red flywheel on the Frontier & put a Nova chip in place of the points,would that work? Trying to get an IEL Beaver to run again. It was seized when i received it.I have it all apart and think i can get it to run if i can find a reed valve for it. Anyone have any parts,or manuals for this old saw,ser # 1232 so it is probably a first year saw 1947 . Sawmiller, 89HD, CM76 and 1 other person like this. I obtained these old guide bars. 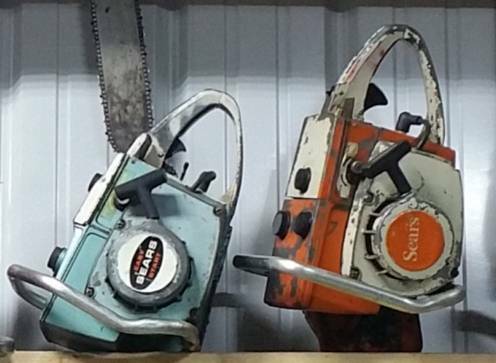 I cant decide if I want to try to sell them, or just hang them on a wall, or if i should try to find saws to go with them. I dont even know what saws they came from. Any guidance would be appreciated. Dahmer and mkinslow like this. The beaver tail bar with the straddle chain would probably fit a Disston DO-100, DO-101. Dahmer, mkinslow, president and 1 other person like this. Yeah, all of the 2 man bars look like they go to the Mercury disston 2 man saws. I know the ones with 4 holes go to older models and the slotted ones go with later models. Im not sure about the penfield bar or the dd terrill bar though. Im also having trouble figuring out what the 2 bow bar pieces go to. Im pretty sure they are the bottom part of a 2 man bow bar but I cant figure out a model. I know where I can get an old Clinton chainsaw for $20.I believe it to be complete.I don't know what model it is,but it said it was either 4 or 4.5 H.P.I don't think it's seized either.Is this saw worth anything? ML12, rocketnorton, sawnami and 3 others like this. Gassed up the 1-62 and checked it over. Been a while since it's run. sawfun, Biigg50, ML12 and 6 others like this. mkinslow and sawnami like this. sawfun, Biigg50, ML12 and 4 others like this. IEL Redhead, in need of parts to restore. Modifiedmark, rocketnorton and mkinslow like this. A couple more on the shelf, pioneer 650 runs great. The AB runs, needs carb adjustment, looking for information on tillotson AJ-28A. Biigg50, fossil, ML12 and 2 others like this. rocketnorton, 89HD and mkinslow like this. Biigg50, 89HD and mkinslow like this. mkinslow and camel2019 like this. ML12, rocketnorton, PogoInTheWoods and 3 others like this. Couple of my collection , out for some fresh paint and maintenance. pioneerguy600, rocketnorton, PogoInTheWoods and 2 others like this. 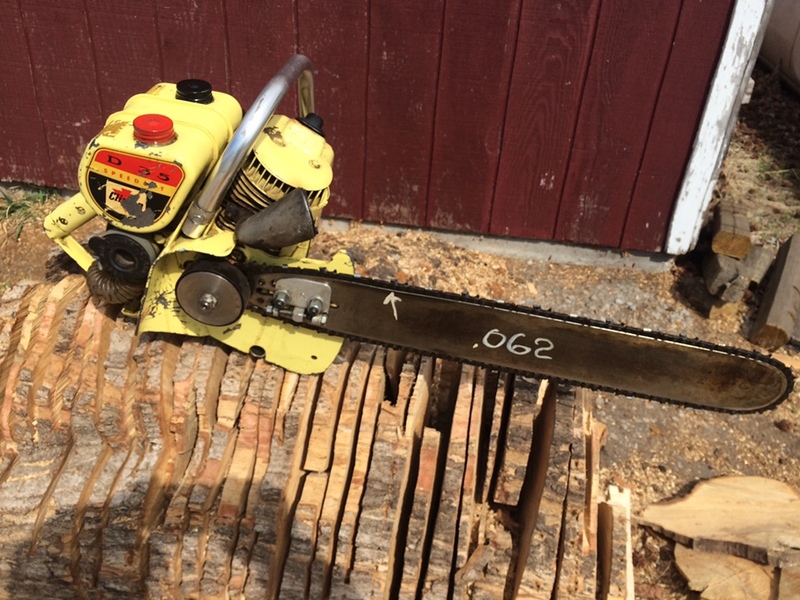 Im buying a few older saws this weekend and this one is in the bunch. You guys have any idea what it is? Just matching pictures with what I found on google im thinking D49 but the handle isn't right. Left is direct drive 49, right is gear drive. Does it have the label intact on the backside of the air filter cover?.